The inside story of one of the most successful networks in modern television history: ESPN. In 1979 it began as a mad idea of starting a cable channel to televise local sporting events, and now spans eight channels in the Unites States and around the world. Drawing upon over 500 interviews with the greatest names in ESPN's history and an All-Star collection of some of the world's finest athletes, bestselling authors James Miller and Tom Shales take us behind the cameras. 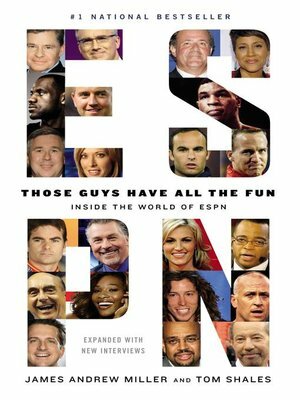 Now, in their own words, the men and women who made ESPN great reveal the secrets behind its success, as well as the many scandals, rivalries, off-screen battles and triumphs that have accompanied that ascent. From the unknown producers and business visionaries to the most famous faces on television, it's all here.